Remembering today my childhood dance school days..
My parents made me join a dance class at very young age when i didn't even know what dance is. my father has inclination towards literature and telugu poetry.He wrote some poems and short stories in his childhood which were published in magazines. 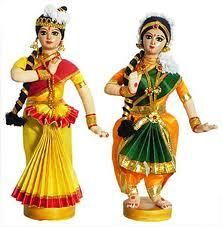 My mother didn't learn any art form but she is a good listener of classical music and used to enjoy classical dance. They both decided to make my sister and myself artists so that we impart our values, culture and Indian arts to our next generation. 1. Children who participate in extra curricular activities behave mature and they are able to handle pressure situations better than others. They will be more expressive or communicative. 2. Arts improve concentration. When we take dance for example, we need to concentrate on rhythm of music played, on lyrics of song and expression. In case of music, we need to concentrate on shruthi, raga and laya. 3. Arts give discipline in life. Children who learn them will manage time better and utilize time in a better way instead of wasting time watching unnecessary things in TV. 4. Arts will improve innovation and creativity. My dance teacher never restricted me saying we should perform a song only in one particular way with particular steps. She used to help me in understanding the meaning of the song and explain steps based on rhythm and encourage to use my creativity to develop it further. :)Thank you for this insight. I have never been formally trained in any art as such. But my blog lets me be more disciplines, more caring towards other fellow bloggers [example u] and more importantly, you want to hear others' voices. Glad I found a voice, as melodious as yours. thanks @ideator and @Divenita for dropping by and commenting on the post.